Hello there. My name is Pepper Nivalis. at Sky Sky Studio in Hokkaido, Japan. I love singing, cuddling, playing video games and watching nature documentaries. And I guess I should tell you that I’m also a were-weasel. that build up inside while I can’t satisfy them directly. I also like to paint and draw, but I definitely need to work on my technique. Not so much into gore, vore or death. 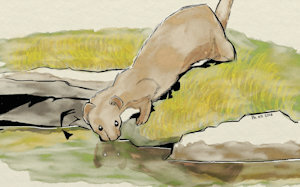 Is that odd for a weasel? Anyway, I truly hope you like what you see here.